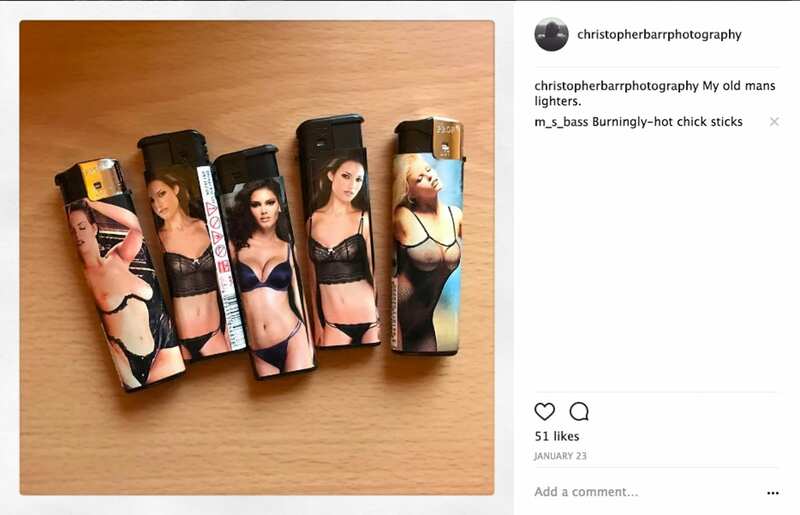 I had come to know in lateral Internet terms Christopher through various photographic channels on social media. He has been a supporter of this publication and we have had some minor dialogue over the past few years. It was when I saw his portraits of his dying father that I really felt the weight of his work in full force. The very public display of ongoing and impending death left me with uncomfortable feelings about my own past and how the grieving process works. 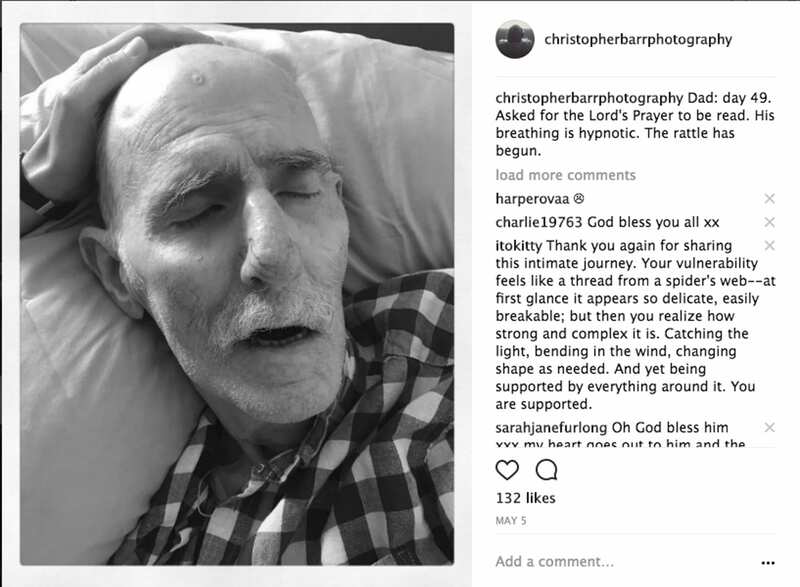 Christopher’s images of his father’s passing were playful, filled with love, but also filled with the catharsis of loss, and the images were made before death actually occurred. It was a striking exercise to view. I felt oddly involved in the prognosis and lamented his struggle as it was posted on Instagram. My own history with death consumed me and I felt that I was witnessing something very difficult and very brave. Sometimes photography can express things that are harder to put in words. 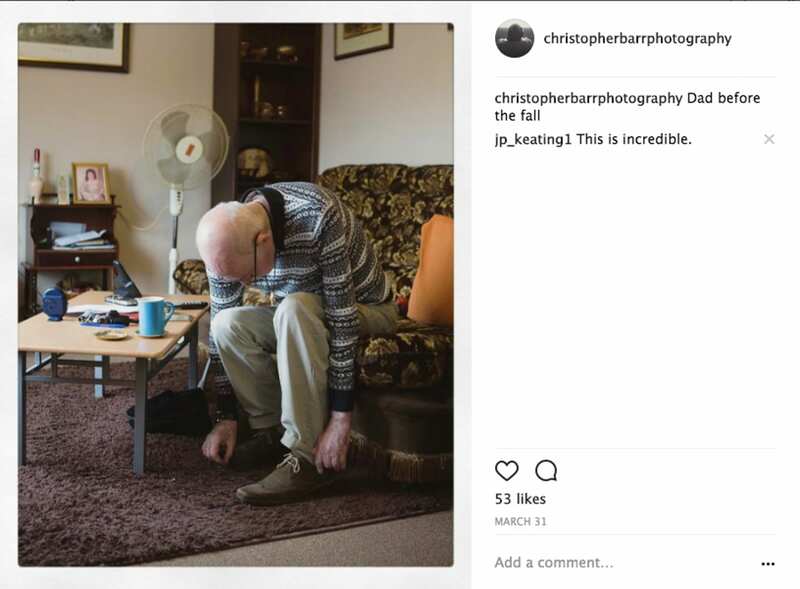 I asked Christopher if he would grant me a conversation about the process and discuss his father, but also the ideas central to grieving publicly in the age of mass image distribution. As I sit reading his answers, I am again filled with a loss, but also, it is a loss in which sadness presides, but there is some consolation in knowing that in and amidst the trauma of death, one is never alone no matter how quiet the discussion can become…..
BF: I don’t know how to really start this other than to tell you that I am truly sorry for your loss and that I think what or rather who and under which conditions you chose to photograph that person was brave. It was not dark. It was not sad. 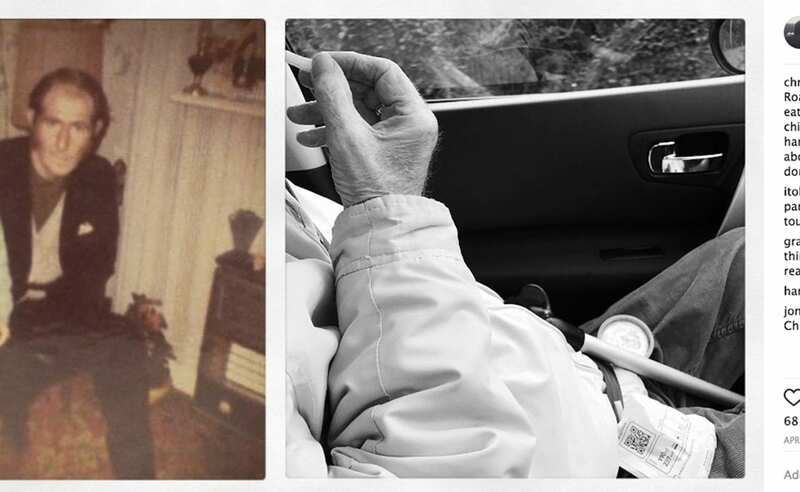 But, watching your father die in still frame via Instagram was something that shook me a bit. I watched the ups and downs. I watched your wife and family gather in as support. I saw your young son intermixed and it somehow all made sense. So, to ask a few questions, you will have to forgive some of the blatant use of language in such a sensitive time. When we spoke about this series, you had said that you were comfortable to speak about and show the images of your dad before he passed away. You had said something to the effect that it was part of the process and that he would also have wanted it shown. Can you tell me a bit about how you came to that arrangement? Had you spoken to him about what you were doing or what the possibilities for “Dad, a Very Public Death”? CB: The day my dad found out he was dying I was called to the hospital. I drove for an hour totally numb. 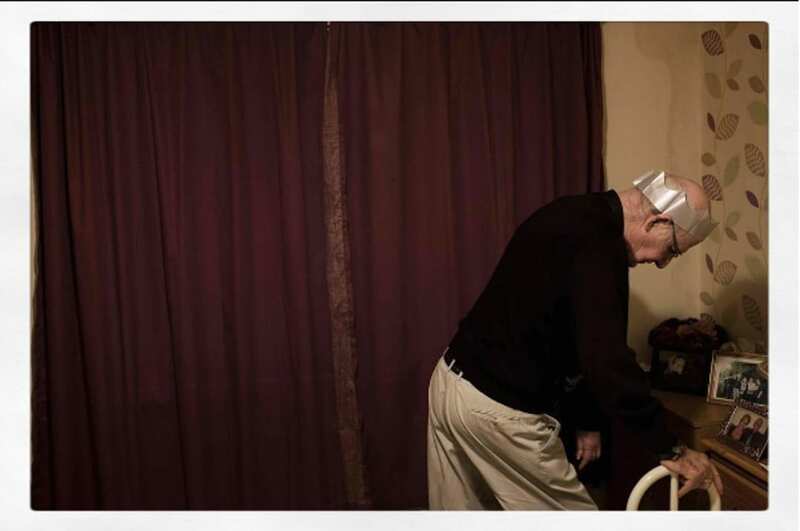 On entering the hospital ward I saw my dad sitting up in bed his head bandaged from the fall that led to the blood tests that led to the diagnosis, this is how it will be for most of us. He had just been told minutes before I arrived that he had advanced lung cancer, cancer of the spine, liver cancer, cancer around his heart. Basically fucked, no return ticket. I walked up to the bed and he turned to me and the first thing he said was that he had had a great life and wasn’t scared to die, he said this while crying hard but he had accepted his death. He accepted his death and was going to show me how it should be done. The last lesson a man can teach his son. My dad and I had only 15 years together, when I was eight my mum and dad divorced, we talked but not much else then we were reunited seven years ago. So this was like a second loss for the both of us. As things settled into some form of fucked up normality we talked about death and its possibilities. A digital afterlife perhaps. My dad couldn’t turn over the TV- so was his technical inabilities, so when I talked to him about sharing his death on social media with family and also total strangers and he agreed, but in a way that was almost an acknowledge of my need to do this. We discussed societal boundaries and ethics, my dad would stop me during these conversations and say “you know I am going to be dancing at Patrick’s wedding” and just smile. We look at poetry, paintings, film. I began taking one photo a day uploading it and writing a diary of death. Mood, food consumed, weather and his and my personal feelings. The initial photos were difficult to take. A strong independent man completely alone in an unfamiliar room, I couldn’t even imagine his ability to seem upbeat. Where and what would I capture? His despair, my despair, or the innocent view of my 4 and a half-year-old son? All of these questions sat heavily on my mind. So through the 52 days it worked itself out, to a degree. We did what any father and son would do, he showed me how to die. I would go to work come home and walk to the nursing home, there we would just exist, in a father dying, son learning type way. I took photographs never showed them to him, uploaded them wrote the words there and then ‘no editing later’ was the one of the few rules we discussed, and then the next visit I would read him the messages and count the likes he had got. Blunt but beautiful. Dad just could not fathom total strangers from Russia, Germany, Africa, South America, China, but it brought him such delight. “Why”, he would always ask…. Why? I told him he was just beautiful and people loved him and the honesty of his/our journey. The taking of the photos were such a small part of our time together, hundredths of seconds but the talking and laughing together amounted to days. By the end we knew by comments made by viewers we were living others missed deaths. We would laugh about a photo book where you could stick your own loved ones head onto my dads and mine and have a kind of death sticker book. BF: I think by and large we tend to shy away from images of death today. Having collected post mortem photography for nearly two decades, I can tell you it was not all this way. There were a few factors for this. Primarily, it was a different sense of memory, or rather how technology could aid memory in a time when premature death (particularly infant mortality) was a rule of life without modern hospitalization methods and procedural administration of medicine. I am curious as to your position on the matter of how the distribution of the images via social media may have acted as a catalyst for mourning for you. It’s a new phenomenon to many I think, to pre-grieve, grieve, but then to grieve publicly. The images on your website show the Instagram screen shots including text. It is powerfully executed. You obviously thought it all through when deciding to look at it as something that could be collated. Looking at the images on the website, I notice there are no photographs of the funeral or your father after he passed. I thought I remember seeing some images during the time of him passed. Can you tell me if you chose to make that severance on purpose or were you unable to make those images and I have it remembered incorrectly? CB: The idea of the distribution at the beginning of the work was two fold, firstly to simply let family and friends join my father and I in a journey the second was to let my father join in my journey and I in his, there are of course on-going and profound shifts in contemporary attitudes toward death which made the making of this work easier to share, and of course we are both Irish, this became a visual vigil a digital wake. “death still speaks with a louder voice in Ireland” as the writer Kevin Toolis so rightly says. The thoughts of people writing and ‘liking’ didn’t hold the power, which they later came to have. I didn’t initially see it as grieving publically, the process felt much more like a pre-grieving as you rightfully comment. The idea of pre-grieving or anticipatory grief on post-death bereavement adjustment interested me, I was aware of Freud’s (1917) work, ‘Mourning and Melancholia’ the thoughts on the difference between the conscious mind and the unconcious mind. These are the very things I was trying to grapple with, that mourning is considered a healthy and natural process of grieving, a loss of love, while melancholia is considered pathological. So was my making of the work healthy? Was there elements of melancholia? This is something I have yet to ask myself. There are images and video work of my dad after he passed, but none of the funeral, I was oblivious to everything but the fact of death and as soon as my father died I set the camera down and started to make plans for his burial, during this time I was also working on the second piece of work around losing my father, the removal of his belongings the dismantling of his and my past. The discovery of a life I knew little or nothing about. Drawers containing life long secrets. BF: One other aspect that I find characterizes the work to great affect is that the document, if we can call it that, or if perhaps I can, is that you feel more love inside of the work than sadness. The image of your father with the popsicle is the one, which breaks the cycle of possible despair for me. There are other images that are of similar care, humor (dad introducing himself to people that do not know their names) and empathy. I can’t imagine how you got to a point of editing. It must have been difficult, perhaps more difficult to work with those images…. CB: This is completely down to the personality of my dad. He had a very simple outlook on life, yet otherworldly in a very 1970s sense. Carry on Death perhaps. I can make no claims to the work being anything other than what he made it. He was a gentleman who embodied all of the words that you have spoken of. There was no editing of the work. The work was made and uploaded in the order in which it was made. The rules were simple one image a day and when it was taken the diary entry was made and would not be edited at a later date. No editing of images or of words. This made the work hard to make, there were a hundred images a day that were missed. And a thousand diary entries. This is a very simple answer I think. I have not mourned my dad since he died. Now this may still be in the post. But I feel through the process of taking and uploading images we both did our grieving. We made the memories. The laughter and silences it leads to a joint understanding… an empowerment. It felt like we were cheating grief. BF: There is a picture of a calendar with a portrait of your father and a woman in it. You had remarked about cleaning out the flat…day 61 I believe. There is some text from your Instagram post speaking about things you had not known about…parts of a life you had not known about. This portrait somehow materializes as a metaphor for this. Without asking you to elaborate on the circumstances of the photograph, can you give me some idea of the correlation between your words and how this particular picture may have triggered the thoughts? In other words, did photography in this case act as a catalyst for the familiar unfamiliar, seeing your father in perhaps a context that you were not expecting in a photograph and how did that relationship then become the totem you wished to capture? CB: My parents divorced and I was raised by my grandparent’s form the age of 8, seeing my dad maybe a few times a year. My dad had a second wife, Freda (the lady in the photograph), when Freda died 7 years ago my dad and I finally came back into each other’s life. My father was paralysed when he was 21 from a skiing accident in Germany and needed caring for. This then fell to me.at this point of getting to fall in love again it was the making of images and the taking about images that brought us back together. So when I had to clean out my dads flat there were many things that were unfamiliar to me, photo albums of a whole other life. First pints, summer holiday’s weddings where I was missing. The second piece of work addresses this time. The particular image was clearly important to my dad as it was in the drawer beside his bed with all the things he held dear. A piece of holiday memorabilia, my dad I think was around 50 in it, the age I am now. It spoke to me. BF: How has your family reacted to you making and sharing these images? I mean your intimate family, but also other relatives,…aunts cousins and the like? CB: I have no immediate siblings from the marriage of my father and mother. My mother has made little comment on the work for what reason I am unsure. My father and mother both remarried but in later years became friends again and I know my mother was upset at my fathers passing. Cousins from my father’s side have been mostly positive, a mix of Irish and North American. BF: From this point, and I ask as I also had made posthumous portraits of my mother and grandparents when I lost them…are you at all concerned about the way in which these images will continue their existence? Do you feel that they will elude a particular aspect of closure by their presence or are you satisfied that their continual observance is something that you can bear? 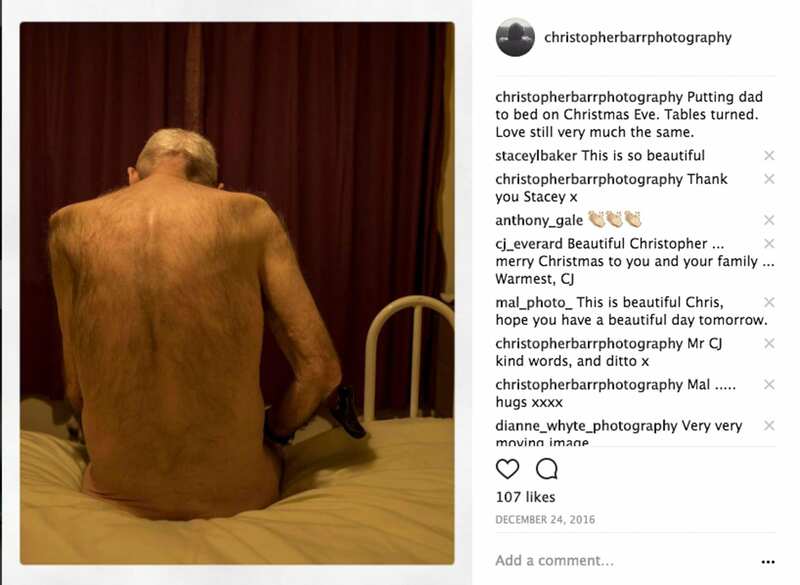 CB: Sharing my fathers death with ‘an audience’ online is a question that I thought about long and hard about before I uploaded the first image. My father loved the notion of a visual mná caointe, a form of digitised keening that would out live even his family, this ancient form of death sharing but living on disrupting the social order of my uploads suspended in a thereptic theatre of death, fifty two days that penetrated grief. I have viewed the images and delivered several talks about the work the continual observance is part of dealing with my loss. Posted in Feature, Highlights, Interviews and tagged Brad Feuerhelm, Christopher Barr, Death, Documentary, Instagram, Ireland, Kevin Toolis, Sigmund Freud, Social Media.